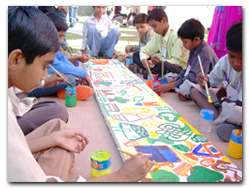 The Environment Education activities started even before inception of Centre for Environment Education (CEE) in 1984. As the activities and programmes grew the Western Regional Cell was formally established in 1997. Ahmedabad being the head office, most of the programmes of CEE coordinated, implemented and demonstrated is in Gujarat, Rajasthan, UTs of Daman & Diu and Dadra & Nagar Haveli.